Chris joined the Metropolitan Police in 1980. Following service in Central London he ran an estates policing pilot in South Acton and then joined a New Scotland Yard policy group with responsibility for estates and inner city policing. This work included a secondment to the London City Action Team. In 1994 he transferred to Staffordshire Police and as Superintendent. In 1998 he was promoted as Assistant Chief Constable in West Midlands Police, he was promoted to Deputy Chief Constable in January 2003. In 2006 he was appointed the Deputy Chief Executive and Director of Policing Policy and Practice at the National Policing Improvement Agency (NPIA) based in London. He was responsible for research and evaluation, doctrine development and implementation and portfolio management. 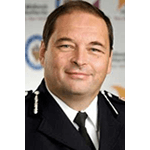 In September 2007 he was promoted to the position of Chief Constable of Staffordshire Police and then in 2009 he was appointed Chief Constable of West Midlands Police. He retired from this post in December 2015.